Commun and Kolev provide here as co-editors an introduction to the volume. They refer to the conference in Geneva which has led to this collection of contributions, and embed the volume in the multifaceted literature on neoliberalism. Along the aspects of Wilhelm Röpke’s life and work, Commun and Kolev depict the structure of the volume. The biographical section portrays Röpke as a European public economist involved in manifold international networks and discourses. The section on economics presents Röpke as a pragmatic political economist amid the tensions between Keynes and the Austrian School. 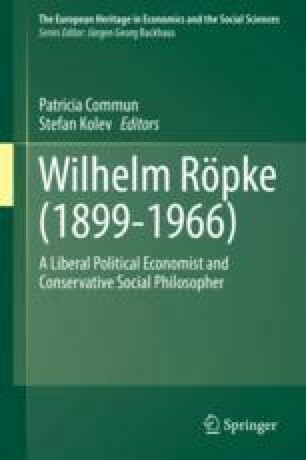 The section on social philosophy sheds light on Röpke as an eclectic social philosopher at the intersection of conservatism and liberalism. Finally, some major challenges posed by Röpke’s heritage are outlined.